The United Nations has piloted a study on e-government development in 40 cities around the globe for the very first time. Moscow has topped the e-government survey followed by Cape Town and Tallinn. 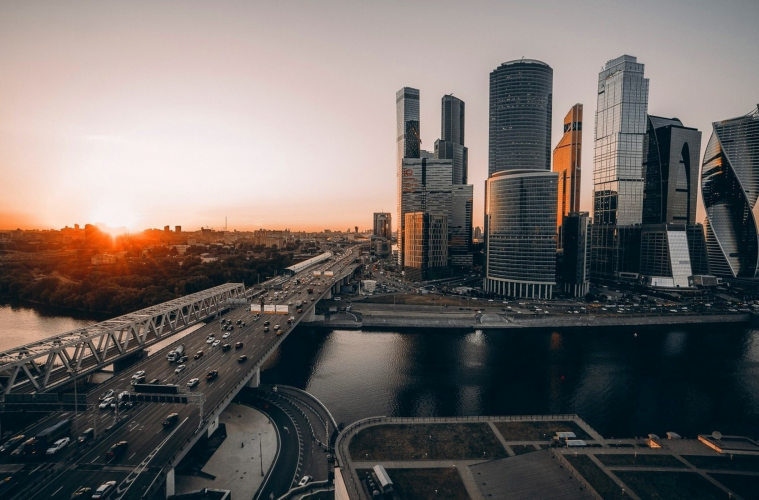 Moscow, July 30 – The recent United Nations (UN) E-Government survey piloted the study on the e-government services across 40 cities that represent different continents – Asia, Africa, the Americas, Europe and Oceania. The study ranks Moscow the highest, followed by Cape Town and Tallinn (second, tie) and by London and Paris (fourth, tie). The remaining cities in the top 10 are Sydney, Amsterdam, Seoul, Rome, Warsaw. The full list represents 40 cities from various continents: Africa (7), the Americas (6), Asia (13), Europe (12), Oceania (2). So, all geopolitical regional groups of United Nations Member States were covered. The United Nations compiles the survey every two years and it aims to examine how governments can use e-government and ICT technologies to build sustainable and resilient societies. 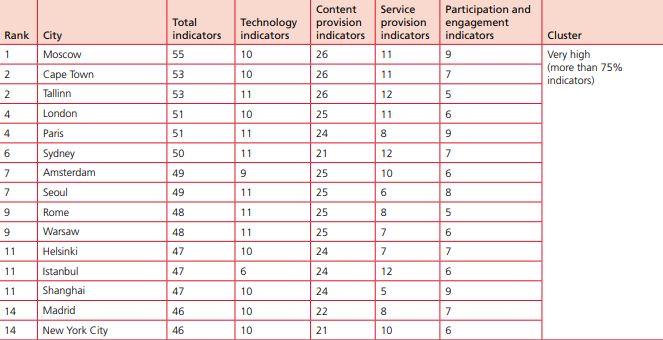 This year the survey has assessed how the e-government is developed across 193 UN members. However this is the first time when the survey has also piloted a study on e-government in 40 cities around the globe. The survey developed the Local Online Services Index (LOSI) in order to analyze cities’ performance. Each city was analyzed against the 60 LOSI indicators that cover 4 different criteria groups. Citizen engagement and e-participation (9 indicators): it includes relevant participation and engagement mechanisms, such as feedback/complaint submission, social networking features, online deliberation processes, announcement of upcoming e-participation activities, etc. Each of the 60 indicators is described a “value 1” if it is found in a municipality website, “value 0” if it is absent and nothing if it is not applicable. As a result, Moscow has scored 55 indicators out of 60 which is the highest result overall. The highest result is obtained by content and citizen engagement criteria. Andrey Belozerov, Strategy and Innovations Advisor to CIO of Moscow welcomed the results: “We are glad to hear that Moscow is leading e-government in the world. It is our priority to provide as much digital services as we can to simplify citizens’ lives. Moscow is a case study for other Russian cities to replicate the model throughout the entire country in the very near future”. Muscovites indeed frequently use over 222 public digital services provided by city authorities via desktop and mobile. The locals have requested a city service over 259 mln times in 2017. In comparison with 2016 the number of requests increased by 31 percent. The most popular city services requested by Muscovites are the following: online school grading with 144.5 mln hits, digital home utilities metering with 34.6 mln hits, payment for traffic fines with 21.5 mln hits and digital appointment at doctor with 11,2 mln hits. Moscow Government is dedicated to engage more citizens through city platforms. As an example, Active Citizen e-voting platform was launched in 2014. It is a non-political e-voting system that allows Muscovites decide on a wide range of issues such as new public transport routes, speed limits in the city center. Since the launch in 2014, Active Citizen has gathered more than 2.1 mln users and 100 mln opinions. In total, there have been over 3 600 polls held. Active Citizen motto is “The city entrusts you to decide”. Recently Active Citizen has launched blockchain in order to increase transparency.